Clearview’s patented protected revolutionary design is a worlds first in external bone fixation. This light weight, radiolucent engineered polymer fixator is not only strong but healthier for the patient. Through a strategic partnership with GE, Umbra Applied Technologies created the world’s first medical grade Lexan based wrist fixator. Safer, Low Profile & Lightweight. 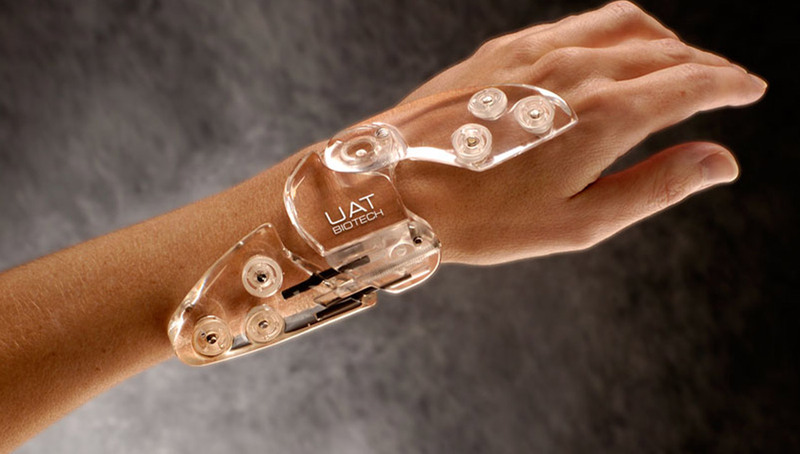 With UAT’s ClearView Wrist Fixator the need to expose patients to excess radiation is eliminated. When applied, the fixator has less than a 1-inch profile and is made of super-lightweight, optically clear, radiolucent polycarbonate material. The polymer is designed specifically for EtO, steam and gamma sterilization. No assembly is required; the fixator comes ready to apply. And the instrumentation included makes application quick and simple. The fixator is adjustable across both the AP and ML planes giving the surgeon ultimate flexibility to accomodate common wrist fracture scenarios. Each plane can quickly and easily be adjusted by a single set bolt for ultimate versatility. The ClearView™ Wrist Fixator allows the surgeon to easily perform intraoperative and intraoffice distraction and adjustments. And all the above enable the patient to quickly resume everyday tasks such as donning clothing and performing simple hygiene — “luxuries” that traditional, more cumbersome fixation devices simply do not allow. The wrist fixator is translucent and radiolucent, giving the operating surgeon an unobstructed view of the trauma area, regardless of the viewing angle — AP, oblique, or lateral. Half pins are the only elements visible on an x-ray.